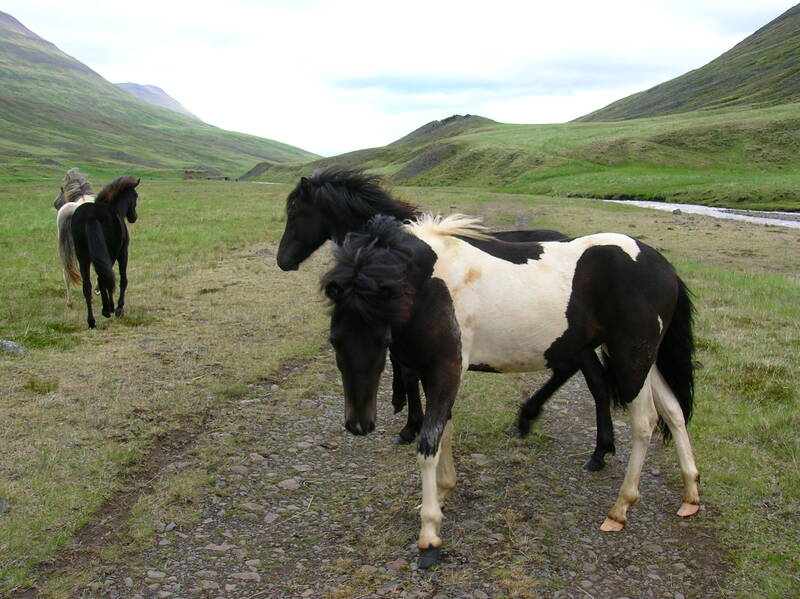 A 4-5 day, 320 km cycle tour across Iceland, both off and on road. Iceland is probably the most spectacularly different landscape you can reach on a short haul flight from the UK – it’s seriously wild, remote and sparsely populated. The stark beauty of the desert-like interior together with its glaciers, geysers and waterfalls make Iceland a fantastic and committing destination for bikepacking. Cycle touring Iceland’s Kjolur route described here is a good initiation to the interior of Iceland. The interior of Iceland is essentially volcanic lava and is devoid of settlements and is criss-crossed by gravel roads and 4×4 tracks. 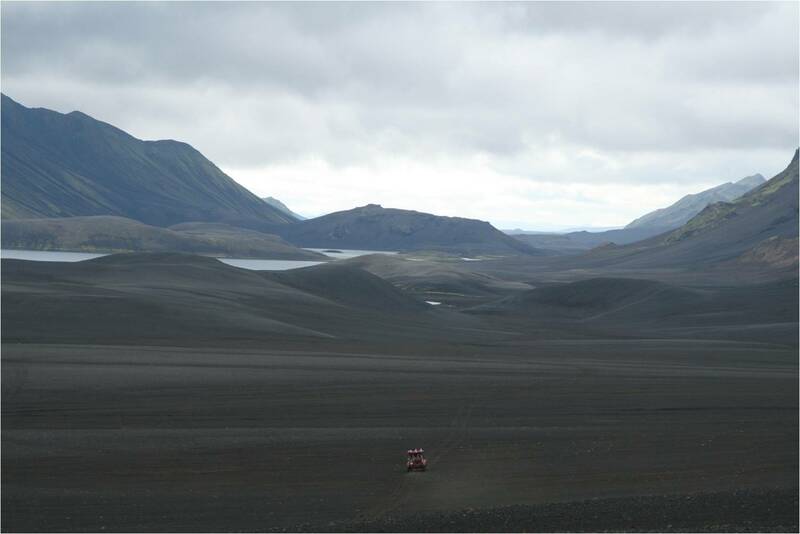 The Kjolur is a 4×4 gravel road that passes between the glaciers of Langjokull and Hofsjokull and traversing the desert-like plateau of the interior. The type of surface can vary – it should be completely rideable but expect potholes, washboard and some sandy/grit sections all of which can slow progress. All the major rivers are crossed by bridges. Once you have climbed steadily on to the plateau at about 700 m the route is generally undulating with no major climbs, although overall ascent on the trip is over 3,500m. 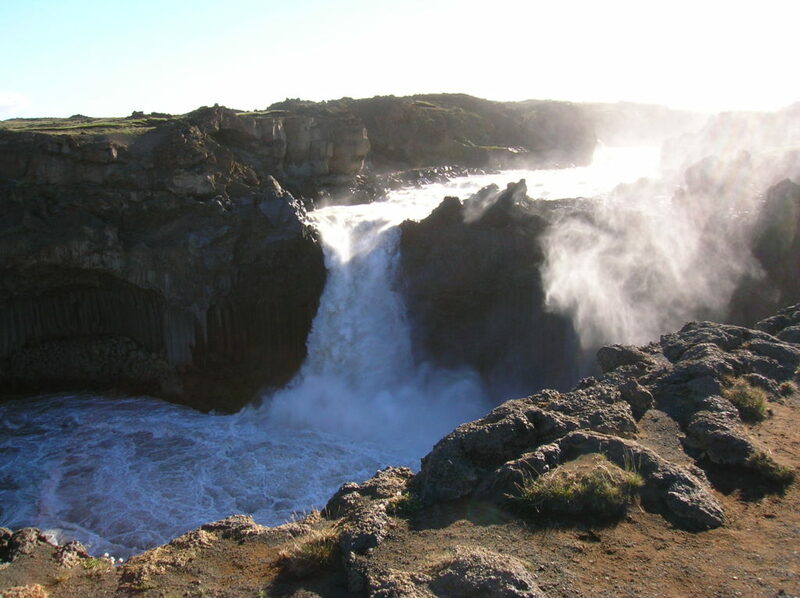 The Kjolur route itself is about 200 km in length starting about 25 km inland from Blonduos in the north and finishing at Gullfoss in the south. From Gullfoss tarmac roads take you to Reykjavik. 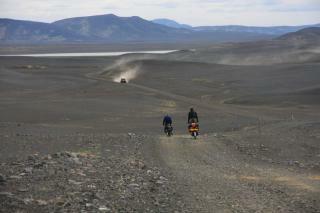 We rode from north to south starting in Blonduos and finishing in Reykjavik. The only reason we rode from north to south was because we only had 4 days to do the trip and that this would give us the maximum time on the last day to get to the airport! Logic, and the weather at would suggest riding south to north as the prevailing winds are south westerly or westerly. You do need enough spare time to enable you to allow for bus timetables – only 2 buses per day – and travel time back to Reykjavik. If you get an early flight to Iceland it’s possible to start from Blonduos by early afternoon – the bus from Reykjavik takes about 4 hrs. Blonduos is a small costal town with a campsite, garage and shops. Garages seem to sell paraffin (kerosene) at the pumps rather than in bottles. After stocking up with fuel we headed out towards the Kjolur route itself. Initially we followed the tarmaced 731 road through farmland reminiscent of the coastal areas of northern Scotland, passing a few lakes until after about 25 km we met at the F35 Kjolur route and the ride into the interior starts. Not long after this we stopped and camped beside a lake. The next section is the most memorable, wild and satisfying of the trip. You climb gradually towards a broad col between the two glaciers with the landscape becoming more barren and desolate whilst the glaciers grow in prominence. Hveravellir has a hut, campsite and geothermal pools and lies west of the Kjolur close to its highest point. We didn’t camp at Hveravellir but carried on for a few km , took a turn to the right and camped on a rare patch of grass on the riverbank. 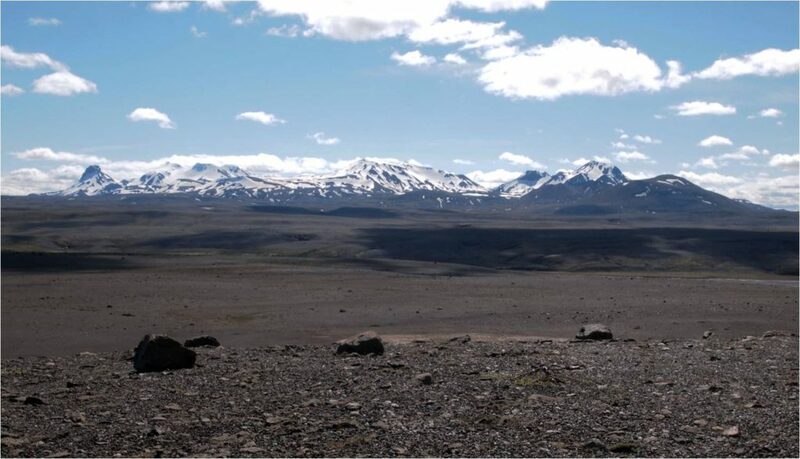 This is a literal oasis in the lava desert we had been riding through all day and gives a fantastic view of the Langajokull glacier. You continue to follow the F35 as it descends towards Gullfoss waterfall, one of the most impressive waterfalls Iceland and well worth a diversion. From Gullfoss headed broadly west, mainly on tarmac roads, to Pingvellir where’s there is a campsite. From Pingvellir its about 45 km on tarmac road back to Reykjavik way you can take the bus to the airport. Photograph below is not Gullfoss but another waterfall. We arrived in Reykjavik in time to have a big meal and a beer before catching our midnight flight back to the UK. At the time we didn’t realise how lucky we had been to be able to complete this trip in 4 days – it was only on our next trip to Iceland when we encountered storm force winds did we realise how rapidly things can change! Summer is the best season, particularly June and July when you can experience virtually 24 hour daylight. As the weather is dominated by Atlantic weather systems it is the immediate weather patterns prior or during your trip that will affect the type of weather you have. Even in summer it can be cold – think late autumn in Scotland. Camping http://www.visiticeland.com/plan-your-trip/accommodation/Camping/ lists campsites. Wild camping in the interior. Although there are some huts you need to carry a tent – definitely 3 or maybe 4 season – as it gives you greater flexibility and emergency shelter if you need it. Not surprisingly you need to be fairly self-sufficient in terms of bike spares, food and fuel – there are no shops or supplies anywhere in the interior. I’m still learning from you, but I’m trying to reach my goals. I certainly liked reading all that is written on your site.Keep the stories coming. I liked it!